In the event the President and/or Vice President of Education are not in attendance at the meeting and has not designated, in writing, an active individual member of the club to act as his or her proxy at such meeting, the officer or proxy holder in attendance shall be deemed to hold the proxy of the other and may, therefore, cast two votes at such meeting. You must be an ACTIVE member of the respective club to receive the ballot on their behalf. If my Club President or VPE emailed me an electronic copy of their PROXY can I show my smartphone to the credentialling desk and receive the ballot for the club? Where can I read more about the Proxy process? See the District Leaders Handbook? 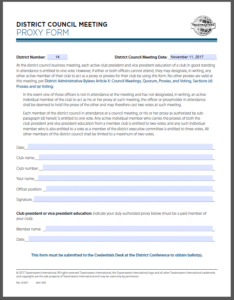 District Administrative Bylaws, Article X, Sections (d) and (e). Copyright © 2019 District 14. All Rights Reserved.